Despite November’s blockbuster Black Friday and Black Monday results, more Americans expect to spend less – not more – this holiday season than they did last year. We think today’s tepid retail sales report confirms what we’ve suspected from our own survey data: as in 2010, Americans took advantage of Black Weekend sales incentives, but aren’t likely to carry through their purchasing pace through the holidays. 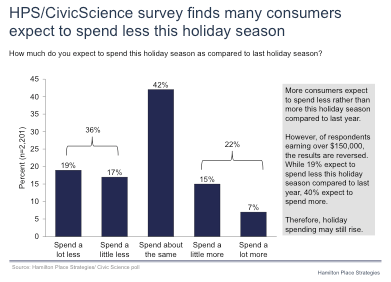 The latest HPS/CivicScience survey of American consumers shows that while 22% say they expect to spend more, 36% expect to spend less – with nearly 20% saying they expect to spend “a lot less”. From an aggregate economic standpoint, one glimmer of hope comes from a look at the income breakdown in our survey: wealthier Americans are more likely to spend more this year, possibly offsetting the reduced purchasing rate of lower income consumers. If Americans in higher income brackets spend more overall, it could still result in a relatively positive year for many retailers and support US GDP growth. Tony Fratto is a Managing Partner at Hamilton Place Strategies, former Assistant Secretary at the U.S. Treasury Department, and a former White House official. He is also an on-air contributor for CNBC. You can follow him on Twitter at http://twitter.com/TonyFratto.